Bawdsey is the end of the line, whichever way you look at it. And there are essentially two ways of looking at it; most famously, from Felixstowe Ferry, on the far bank of the Deben, where walkers and weekend sailors sit outside the pubs gazing across to the pine forests and heathland of the Bawdsey Peninsula. The amazing Bawdsey Manor, a Victorian confection of Elizabethanisms, faces back, and was where radar was developed. Today it is a language school. You see it as you walk from Old Felixstowe, past the martello towers and the golf course. Or, you can look at Bawdsey from the peninsula itself, where two lonely roads come together at Alderton, and thread through to the Manor, where they stop. In medieval times, Bawdsey was part of the Kingshaven, a group of harbours around the mouth of the Deben.Then, Bawdsey was on an island, a causeway connecting it to the mainland. But the sea has cut in over the last 500 years, the Deben has silted up and changed course dramatically, and only Bawdsey is left, beached on the Suffolk coast. Actually, the village is barely separated from Alderton, and below are fine views of the sea and two more martello towers. The whole place is riddled with machine gun emplacements and WWII defences. But Bawdsey is not only the place where radar was developed; it is where two national heroes who never actually lived here are immortalised, where a great Suffolk church has been reduced to a stump and chapel, where Guy Fawkes is responsible for a Victorian restoration, and where you'll find one of the most singular post-boxes in the world. Bawdsey's story pivots around a man called William Cuthbert Quilter, whose family had amassed a fortune. They rented Hintlesham Hall in Suffolk for ten years in the 1880s, and then bought, at auction, the manordom of Bawdsey. As Lord, he built Bawdsey Manor between 1886 and 1910. Sir Cuthbert (as he now was) had been MP for Ipswich since the 1880s. He was, apparently, a man obsessed by real ale, and the only time he stood up in the house to speak it was on the subject of the purity of beer. He built up a number of independent Suffolk breweries, which, in the 1950s, were conveniently bought up lock, stock and barrel by the Cobbolds, who not unnaturally closed them all down. Sir Cuthbert had such a high opinion of himself and his family that he built an amazing mausoleum in Bawdsey churchyard. You step out of the west door of the church, and climb some steps to a vast chest tomb, with family names on it. Beyond that, more steps rise to an urn. I am sure that if an eternal flame had been possible in the 1920s, he would have had one of those, too. His family's names are inscribed on it. This is interesting, because one of his sons grew up to be the composer Roger Quilter, one of the finest songwriters of the early 20th century, and who, along with Peter Warlock, was part of that English generation before Benjamin Britten. But Roger Quilter wasn't born in Suffolk, and he never lived in Bawdsey. Funnily enough, the church contains another memory of an even more famous person, who not only wasn't born in Suffolk and never lived here, she isn't buried here either. This is Nurse Edith Cavell, shot in Belgium in 1916. The memorial to her great-uncle and great-aunt remembers her as well, with a framed account of her story hanging below their simple wall plaque. The remains of the medieval church are set in the 17th century walls. The arcades were filled in with flint and brick, and the clerestorey broken down and replaced by a brick course. The whole lot was then rendered (now removed, fortunately). 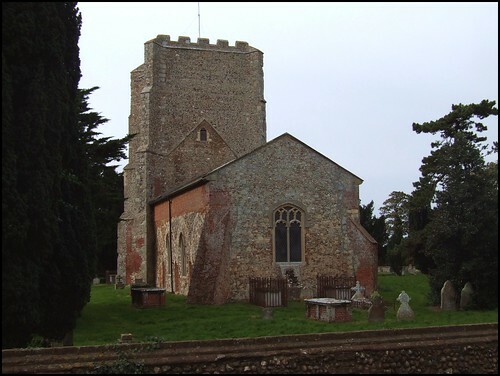 The church was a grand perpendicular affair, in the manner of Blythburgh, Covehithe or Southwold. However, like Covehithe, it was derelicted after the Reformation, and a new, smaller church built in the ruins, probably in the late 17th century. Remarkably, the former arcades were infilled for the walls, and you can still see them in the outside walls today. The tower was in danger of collapse, and in the 1820s, the tiles of the church roof were replaced by thatch, to stop bits of stone breaking the tiles (it is hard to think of this as anything other than a short term measure.) Unfortunately, when a group of youths set off fireworks from the top of the tower on Guy Fawkes Night 1841, the thatch caught fire, and the church was completely gutted. A warning, I suppose, against the perils of Protestant triumphalism. The rebuilt church is basically a Victorian chapel with 17th century walls, a truncated tower (about two thirds was removed), an unusual font, and a pulpit unique to Suffolk.. Although this little church is interesting and welcoming, it can be a bit gloomy inside if the sun isn't shining, thanks to the small windows. The font is a most curious 18th century affair, tapering narrowly and then opening out, and resembling nothing so much as a bird bath. It goes most harmoniously with the Quilter memorial outside, and may well date from a reordering of the church under Sir Cuthbert's influence in the 1890s. The pulpit consists of a frame of banisters, and probably dates from the 1890s, although some early 20th century photographs show it faced, without the banisters visible. The church also contains on display a piece of medieval embroidery, possibly from a cope, that was worked in the 19th century into an altar frontal. It is believed to have come from the chapel at Bawdsey Manor, and may have been collected by the Quilters in Belgium. Unsurprisingly, the church has a special place in its heart for the RAF, who were based at Bawdsey manor during the Second World War and for a number of years afterwards. The Union flag and RAF banner in the chancel make it feel rather crowded, I fear. However, the setting for the church is lovely, and surprisingly rural, given that we are on the main village street. On one occasion, while trying to photograph the Quilter memorial, a deer broke cover beneath my feet, and ran for the woods. I nearly died. And the post box? Well, a bit further along the road to Alderton, the former post office still has in its wall one of the last surviving Edward VIII wall-mounted letter boxes in the world.